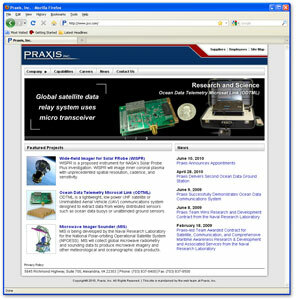 Company Website for Praxis, Inc. I designed this website and handcoded a large portion of it using HTML and CSS. I also used Adobe Dreamweaver a little for the basic foundation of the site. Some of the pieces of the website use Flash and Java and these pieces were done by a co-worker at Praxis, Inc. My personal wedding website. I coded this both by hand and with a little help from Dreamweaver. This site uses stylesheets as well.